Occasionally, ovarian tumors are found to have originated from non-ovarian organs as metastatic lesions since the ovary is a common site of metastasis from many cancers. 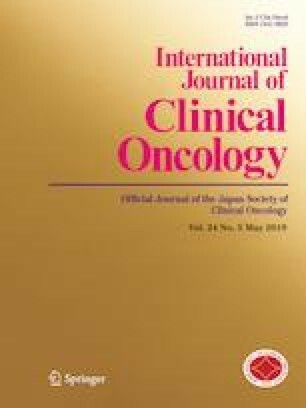 The aim of the current study was to estimate the long-term oncologic outcome of patients with metastatic mucinous ovarian carcinoma (MmOC) in comparison with those with primary mucinous ovarian carcinoma (PmOC) at an advanced stage. The data of one hundred and sixty-seven patients with mucinous ovarian cancer, including 91 patients with MmOC from the digestive organs and 76 patients with stage III–IV PmOC, were retrospectively analyzed. The prognostic significances of clinicopathologic factors were evaluated employing both uni- and multivariable analyses. Pathological slides were evaluated based on centralized pathological review. The median age of patients with PmOC and MmOC was 55 (18–81) and 51 years (30–82), respectively. With follow-up of a total of 167 patients, 145 patients (86.8%) developed recurrence. In addition, 122 patients (73.0%) died of the disease. Regardless of the residual tumor status, patients with PmOC did not a show a significantly poorer OS than those with MmOC. Furthermore, in a Cox multivariable hazard model, after adjustment for various clinicopathologic confounders, a gastric cancer (GC)-originated tumor and larger residual tumor were significant predictors of poorer OS [GC (vs. PmOC): HR (95% CI) 2.205 (1.303–3.654), P = 0.0036]. The oncologic outcome of patients with MmOC was extremely poor; however, it was almost the same as that of those with PmOC. We should recognize MmOC derived from gastric carcinoma as a highly aggressive malignancy. We sincerely thank all members of the Tokai Ovarian Tumor Study Group for collaborating in data collection. HK: data analysis and interpretation, writing manuscript, SS, FU, YI, KN, KN, MK, and NY: data collection, TN: pathological evaluation, KS: supervisor of this work, FK: supervising and funding. This study was supported by JSPS (Japan Society for the Promotion of Science) KAKENHI Grants-in-Aid for Scientific Research: Grant Numbers 17H04338 and 16K15704.